We are less than two weeks from Easter! What happens after Easter Sunday? Journey through the biblical events from the Resurrection to Pentecost with the Happy Saints Easter eBook! 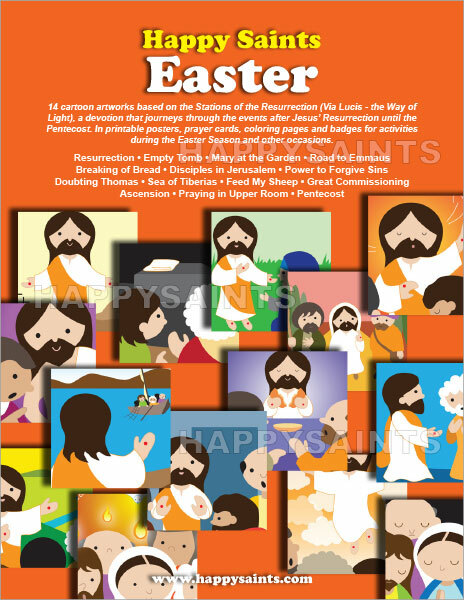 Featuring 14 cartoon artworks based on the Stations of the Resurrection (Via Lucis - the Way of Light); with short Gospel passages and simple prayers. The Stations of the Resurrection is a joyful way to celebrate the glorious Resurrection of Jesus and is a great complement to the more sorrowful Stations of the Cross. This devotion is recognized in the Vatican’s Directory on Popular Piety and the Liturgy.